A very young Wôbanaki child might wear a breechclout or nothing at all in the warm weather. Otherwise, children would dress like their parents. Wôbanaki people slept in what seemed most suited for the season. In the winter this would mean wearing several layers to bed and in the hot weather a child might sleep without clothing. Among the numerous items for trade in the 1700s were wool and linen cloth, ready-made shirts and coats, knitted wool hats and mittens, glass beads, brass kettles, and metal axe heads and knife blades. 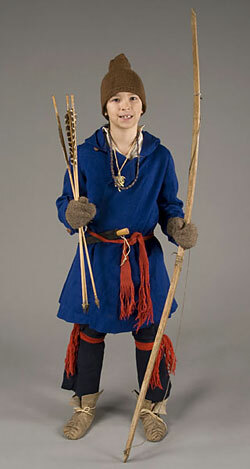 Native American people in New England would trade with the French in New France or the English in the American colonies. Items they received might come from England, France, Holland, or as far away as India. A breechclout, or “adhozoan”, is a strip of fabric or deerskin that goes between the legs and is held in place by a belt tied around the waist. The breechclout might be compared to modern-day shorts, underwear, or a bathing suit. This boy's breechclout is made of wool. These are wool leggings, called “medasal”. They are tied to a belt at the waist to keep them up. Leggings were worn for warmth and to protect one's legs when walking through scratchy undergrowth. It is interesting to note that wool cloth used for clothing by Native people at this time was usually either red or blue. This boy wears garters, or “kiganibial”, tied on just under his knees. They are made from wool yarn, using a technique called "fingerweaving". As the name suggests, fingerweaving is a way to weave by using just the fingers instead of a loom. The garters help to keep the boy's leggings in place. These are summer-weight moccasins with a center seam. They are made from the hide of a white-tailed deer. The Abenaki word for any kind of shoe is "mkezenal". The boy holds a wooden cup for food or drink. It might have been made by himself or by one of his male relatives. 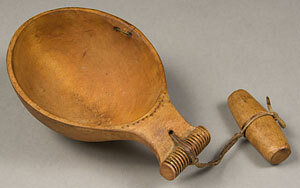 The Abenaki word for a personal wooden scoop or cup is “amkwôn”. Cups like this were useful for collecting drinking water while traveling. This boy's shirt is made of linen. In Abenaki, a shirt is called “wihibaks”. 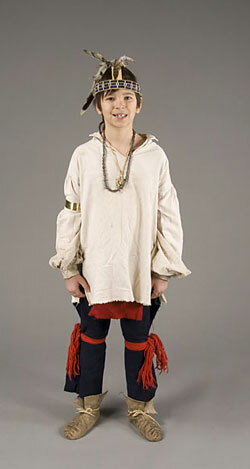 It is the same style that European boys would wear, but theirs were worn tucked into their breeches. This armband is worn for decoration. Armbands and bracelets, called “wpedinibial,” were made from pieces cut from brass or copper cooking kettles. The necklace is made of glass beads from Holland. 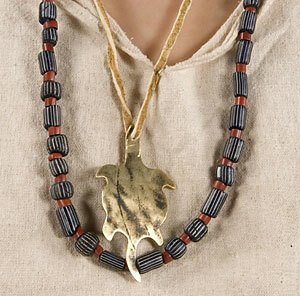 The pendant is a brass turtle and is the boy's clan symbol or personal totem animal. The turtle was made from a kettle that was cut up to make jewelry. 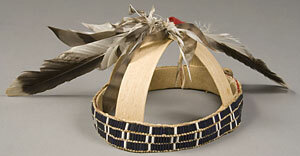 Wôbanaki families belonged to clans, with each clan composed of a number of different families. Clan symbols included the turtle, bear, wolf, deer, fishes, birds, and other animals. Clan symbols varied according to tribal groups. The French call this kind of hooded coat a "capot". The Abenaki people would call a large overcoat like this a "kchi pikizon". It overlaps in front to button at the shoulder, and a sash holds it closed at the waist. This capot is made of wool. Capots were originally worn by sailors as raincoats and were adapted for use in the woods. They were very popular in the Indian trade. A "toque" is a French term for a knitted wool cap. It was received in trade. The Abenaki call these “antigwal”. These are knitted wool mittens that were received in trade. The Abenaki call all mittens, whether made from wool, leather or fur, “meljassak”. This boy hunts with his father's old “tibi”, or bow. These arrows, called “pakual”, have brass heads, which were much thinner and lighter than stone arrowheads. The brass heads were cut from a kettle.